We’d love your help. 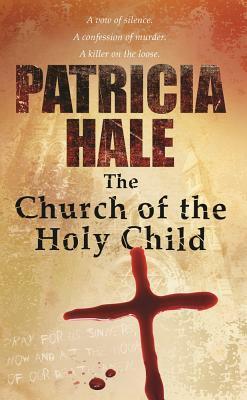 Let us know what’s wrong with this preview of The Church of the Holy Child by Patricia Hale. To ask other readers questions about The Church of the Holy Child, please sign up. Tagged as a mystery suspense story, this one lives up to the tags. A woman goes missing. When her body is discovered, her husband is the prime suspect. But then more bodies are found and the killer could be anybody. Private investigators, police and a priest all have their roles to play as the case becomes more urgent. Imagine being in the position Father Francis is in. A killer confesses their crimes, giving him all the gory details, and he is bound by the sanctity of the confessional, so he can’ Tagged as a mystery suspense story, this one lives up to the tags. Imagine being in the position Father Francis is in. A killer confesses their crimes, giving him all the gory details, and he is bound by the sanctity of the confessional, so he can’t tell the police about it. There are several key characters involved in this case and each has a strong voice. The writing is taut and compelling, drawing you in and keeping you focused as the suspense ramps up. And when you finally find out who the killer is, it’s one of those reveals that catches you by surprise. At just over 200 pages, this book reads fast and the author gets right to the meat of the mystery. Like mysteries with lots of suspense, well developed characters and a thrilling plot? I recommend you read this book. A prologue that sets the tone for the horrific murders that are about to come when a killer relates how a parent was beaten mercilessly and how revenge would be taken on someone else. In the present 23 years later Britt Callahan and Griff Cole are now partners in a PI firm and the phone call they get enlists their help to find a missing woman. The person who called said her sister was leaving her husband and was supposed to let her know when she was safe by 7:30 but the call never came. Beth Jones starts the series of events that will fill the pages of this book, bring chills to every reader through and through as we learn the fate of her sister Shirley. Did her husband find her? Did he take Shirley Trudeau? Griff calls Britt and let’s her know that Shirley is the woman he was sent to look at. You next hear the words and cold chill from the killer talking to Father Francis on pages 5-6 ending with: He knows best meaning the Lord. He doesn’t heart the children, Father. I am their Savoir. Father Francis is numb and can hardly function after that he’s been the priest at the Church of the Holy Child for ten year. No number of Hail Mary’s would erase the hollowness in his heart and the fear within it knowing he was helpless and could do nothing about what he just heard. Britt Callahan tells the story in the first person within Chapter 3 as se learn more about Shirley Trudeau, the first of many women killed and wonders why no one called the police on her abusive husband. Of course the husband is the first one that Chief Haggerty would suspect and the author relates just how she met him and about dating Griff. Griff was sought after for a position in CID but declined it. Father of Allie and really smart and perceptive he prefers working with Britt and at times helping the police when needed. The chilling voice of the killer and the frustration of the priest makes you wonder if the rules when it comes to murder and preventing other deaths should be changed. The police frustrated, no evidence to lead the police to believe that Keith killed his wife and another phone call and another body. Rochelle Davis according to her license and Gina the ME on the scene. But, when all four murders that comes stack up to revealing the MO is the same for each one the limelight goes away from the husbands or boyfriend to someone unknown. As they investigate more they begin to realize that some of the workers at the shelter might be linked to the murders and that someone there might be a leak telling the husbands when their wives are leaving the shelters and leading them to their deaths. Peggy Taunton was a prostitute and did not fit the profile of all of the others who were married. But, somehow that person finds something about her unworthy of her child and she decides to take her life. Rhyder names the killer as the Missionary Killer which fits when you learn more and hear the voice linked to the killer when speaking to Father Francis. Another victim and this person is not done and looking into the missing hotline worker will reveal something that will change it all and let everyone know that someone is on the wrong track and that the killer is hiding in plain sight so why are they so blindsided? When Eliza goes on cruise with Neil leaving Allie happily with Griff and Britt why do they become suspicious when she neglects calling Allie at a designated time every night? Allie becomes upset and wants to understand why her mother has deserted her while both Britt and Griff find links to Eliza and the shelter. Learning the truth and hearing from Neil that she never showed up at the dock to go on the cruise and that he did not seem concerned scares Britt and Griff. Questioning Allie about her mother’s relationship and whether she knew she was linked to the shelter brings out some information and then it clicks. Father Francis has a hard decision to make and when he does he might just turn it all around but not until the FBI agent does blast him and others realizing his time as a priest might be over. When they realize that Allie and Eliza are gone and the killer reveals that might have been done to them can Britt use her powers of persuasion to con this person into thinking she will help that person retain a lawyer and reconnect with the one person that set this person on the course of destruction. Will they get to both of them in time and will they be alive? The tension builds, the suspense if palpable and the ending heartbreaking. Allie if she lives will face years of help in order to cope with what she might have endured? Eliza if they find her in time will she ever become whole? Abuse, hate, revenge, retribution, family discord, family love and loyalty, trust, hope, survival and the realities of what happens when women are battered, beaten, seek help and it backfires are all brought to light in this novel. Britt and Griff face a bold decision that has to be made at the end. What is next for these two and will the author bring them back again to assist the police and keep Detective John Stark on the straight and narrow? A great novel that teaches women why they need to seek protection, follow the plan when leaving and making sure that they have a safe place to go in order to protect themselves and the children. What happens when a priest risks it all: The Church of the Holy Child: Each one is precious and each child is Holy and Father Francis takes a risk what would happen if any other priest had to make that decision today? I enjoyed this mystery. The plot was well done. Hale had me wondering who the murderer was right along with the detectives. She did a good job of revealing information about the murderer without giving away the identity. I like the characters of Cole and Callahan too. I look forward to seeing how they interact in future mysteries. The novel deals with a tough issue. I am not Catholic but I can imagine the weight a priest must bear when he hears a confession that involves a crime. He has made a co I enjoyed this mystery. The plot was well done. Hale had me wondering who the murderer was right along with the detectives. She did a good job of revealing information about the murderer without giving away the identity. I like the characters of Cole and Callahan too. I look forward to seeing how they interact in future mysteries. The novel deals with a tough issue. I am not Catholic but I can imagine the weight a priest must bear when he hears a confession that involves a crime. He has made a commitment to confidentiality, regardless of what he hears. Experiencing the struggle of conscience right along with the priest was enlightening. I recommend this novel to those who enjoy a well plotted mystery with characters that you'll want to follow in future novels. I look forward to their next adventure. I was really a bit "meh" about this one, and at 54% almost gave up. But I stuck with it, and although it was a bit predictable, I ended up enjoying it. Review originally posted on Ctrl, Alt, Books! The Church of the Holy Child was the first murder mystery I have read. It isn’t a genre that I normally read but I am trying to expand my horizon. I am really glad I did too because The Church of the Holy Child was so enthralling, I couldn’t put it down! This book is a quick read but keeps your attention the entire time. The Church of the Holy Child gets straight to the point with solving the murder cases. There aren’t any unnecessary details and it wa Review originally posted on Ctrl, Alt, Books! The Church of the Holy Child gets straight to the point with solving the murder cases. There aren’t any unnecessary details and it wasn’t the obvious culprit. The book is written in both first and third person, which I thought was very interesting. I don’t believe I have read a book written in such a way so it was a nice change from other stories I’ve read. This is a great book and I’m glad I read it. It has opened my eyes to the genre that is mystery. It was a good start and introduction to the genre but it would also make a great read even if you’ve read a million mystery novels. The novel wasn’t overly graphic considering it was a murder mystery. It leaves enough to the imagination and isn’t overly descriptive. It was suspenseful and you can’t help but turn the pages, trying to put the puzzle pieces together yourself. I recommend this book for readers who are looking for something different and something exciting. Don’t pass this book by, open the pages and give it a read! To me, too many thrillers and suspense novels focus on plot and action to the detriment of character development. That's not to say they can't be good; some really are very entertaining and exciting. In The Church of the Holy Child, Patricia Hale does a nice job of rounding out her story by having some very appealing and/or interesting characters and still maintains a high level of tension. The title alone was enough to gain my attention and I was not disappointed in reading this. Britt and Griff To me, too many thrillers and suspense novels focus on plot and action to the detriment of character development. That's not to say they can't be good; some really are very entertaining and exciting. In The Church of the Holy Child, Patricia Hale does a nice job of rounding out her story by having some very appealing and/or interesting characters and still maintains a high level of tension. The title alone was enough to gain my attention and I was not disappointed in reading this. Britt and Griff hit just the right note with me in their working and personal relationships although their first names struck me as too...I don't know, fashionable or something, so I'm glad they're usually referred to as Callahan and Cole, respectively. This pair is clearly in love, not quite ready to fully commit but Cole is comfortable in their current status while Callahan is slightly more angsty. They each bring another element to their work because she is a former family lawyer and he used to be a cop. Because he has kept up his connections with the police force, they are frequently called upon to help out on certain cases. John, a cop friend trying to cope with some real baggage, is appealing in his neediness, and Father Francis is a priest who struggles mightily with the confessional secrecy when his devotion to his chosen path and his sense of justice bang up against each other. All four of these people must find their own way in this current morass of evil in which women are being slaughtered. Not every reader cares for multiple points of view or for being "in the head" of the killer but Ms. Hale's approach worked very well for me. Britt speaks in first person while Father Francis is presented in third person and the killer's infrequent, brief appearances are...well, you'll have to see for yourself because any explanation I give would be difficult to explain without being spoilery. Private investigators Britt Callahan and Griff Cole get a call from a woman saying that her sister was going to leave her abusive husband and has not been heard of. When her body is discovered it seems like a cut and dry case with the husband as the killer. But other bodies are being discovered. The common denominator is they were all abused. Could all of these boyfriends and husbands be killing their wives? Individually, maybe, but when examined all together it is clear that a serial killer is Private investigators Britt Callahan and Griff Cole get a call from a woman saying that her sister was going to leave her abusive husband and has not been heard of. When her body is discovered it seems like a cut and dry case with the husband as the killer. But other bodies are being discovered. The common denominator is they were all abused. Could all of these boyfriends and husbands be killing their wives? Individually, maybe, but when examined all together it is clear that a serial killer is stalking these women. As the police struggle to find the killer, you also meet Father Francis who is in confession with the serial killer as the killer walks him through every step of the murder. He is torn between keeping the confession secret per the dictations of the church or telling the police and stopping further murders. This is an amazing story. A woman is killed and the signs point to her abusive husband. Then another and another. Each look individually to the husband or boyfriend but when compared to each other are similar. All of the women a local women’s abuse shelter and it is looking like someone at the shelter might be tipping off the killer. But the case takes a turn, several of them, from there. Then there is Father Francis. He is torn because he wants to tell the police that the killer comes to confession and admits the details of the murders. But he can lose his title if he goes against the church who beliefs are that confessions are private and never to be shared. I felt for him as he was fighting to stop further killings yet be bound to the church. This is a great mystery/thriller. There are lots of twists and turns that will keep you guessing. I was completely thrown by the killer and was kept on my toes through the whole book. This is a great thriller/mystery thriller that will please any thriller lover. I received The Church of the Holy Child from Partners in Crime Virtual Book Tours for free. This has in no way influenced my opinion of this book. The Church of the Holy Child is a story about revenge, plain and simple. A woman is murdered, hit upside the head with a brick. She had a history of being domestically abused by her husband. She and her child left home and went to a shelter. She had a way to escape her marriage and was going to come back for her child. She was never seen alive again. Another woman meets the same fate, and another, this one a prostitute. How do all these women fit the profile of domestic abuse? The case goes to J The Church of the Holy Child is a story about revenge, plain and simple. A woman is murdered, hit upside the head with a brick. She had a history of being domestically abused by her husband. She and her child left home and went to a shelter. She had a way to escape her marriage and was going to come back for her child. She was never seen alive again. Another woman meets the same fate, and another, this one a prostitute. How do all these women fit the profile of domestic abuse? The case goes to John Stark, a veteran, and friend of Griff Cole. Griff and his partner Britt Callahan investigate the case because a missing woman's sister hires them to find her sister. We also have Father Francis, a priest at The Church of the Holy Child takes the confession of the actual killer. Because Father Francis is obligated to keep what is told to him to himself as the church demands. He becomes increasingly worried and scared that there will be more women killed and has to find it within himself to do the right thing even though it goes against the Church. What did I think of the book? I really enjoyed it. The writing was good, the characterization perfect for the storyline. I liked Britt and Griff's daughter Allie the most. Britt is a tough woman and Allie is a smart and sassy young lady. The book was fast-paced and it took me awhile to figure out who the killer was. There were a few grammatical errors but I did have an ARC so I know that these will be corrected. If you like a good mystery story, this one is for you. This is a tale of domestic abuse and murder – but not in the way you might think. It’s also a story that discusses the moral issues and obligations surrounding the relationship between a priest and his/her confessor. Does the relationship to God trump the sanctity of human life? The author is able to keep this mystery alive and engrossing, with an interesting P.I. team and a cast of supporting characters. Her knowledge of abuse statistics and the effects are effectively dotted throughout the nov This is a tale of domestic abuse and murder – but not in the way you might think. It’s also a story that discusses the moral issues and obligations surrounding the relationship between a priest and his/her confessor. Does the relationship to God trump the sanctity of human life? The author is able to keep this mystery alive and engrossing, with an interesting P.I. team and a cast of supporting characters. Her knowledge of abuse statistics and the effects are effectively dotted throughout the novel in a way that adds to the overall text. This really a great story. The characters are so well written and totally believable. The twist at the end, of who was a serial killer, was complete surprise. I won this book from Goodreads's giveaway. It was an easy read. It's reminiscent of crime TV shows like Criminal Minds, Law & Order or CSI. I enjoyed reading this book. Griff Cole and Britt Callahan are hired by the sister of a murder victim, who in the past was abused by the husband and she wants justice. In domestic abuse cases, the suspicion usually leads to the spouse. But bodies are turning up with very similar M.O.s. Can this be a coincidence or is there a serial killer on the loose? There is one person, besides the killer, who knows the truth. Fr. Francis, a priest at The Church of The Holy Child. The killer visits the priest, to boast of the killings, du Griff Cole and Britt Callahan are hired by the sister of a murder victim, who in the past was abused by the husband and she wants justice. In domestic abuse cases, the suspicion usually leads to the spouse. But bodies are turning up with very similar M.O.s. Can this be a coincidence or is there a serial killer on the loose? There is one person, besides the killer, who knows the truth. Fr. Francis, a priest at The Church of The Holy Child. The killer visits the priest, to boast of the killings, during confessionals since a priest can't betray because of the sacramental seal vow. And now, not only are women being murdered, but their children are in harm's way. Including Griff's ex-wife and daughter. This is the first book that I have read by this author and was instantly drawn into the story and suspense. I thought I had it all figured out not once, not twice but three times, which means there were so many twists and turns that kept me guessing. Gripping! The Church of the Holy Child gets straight to the point with solving the murder cases. There aren’t any unnecessary details and it wasn’t the obvious culprit. The book is written The Church of the Holy Child was the first murder mystery I have read. It isn’t a genre that I normally read but I am trying to expand my horizon. I am really glad I did too because The Church of the Holy Child was so enthralling, I couldn’t put it down! This book is a quick read but keeps your attention the entire time. In this psychologically thrilling crime novel by Patricia Hale, we meet a woman who has become an attorney-turned-private investigator and assists the local police department in the unsolvable crimes. Volunteering her time offering legal advice at the women’s’ shelter, she seeks to offer strategies and support to abused women. The story picks up when mothers are being murdered. We also meet a priest who has been unwillingly pulled into the crimes. An unsavory parishioner has decided to tell him e In this psychologically thrilling crime novel by Patricia Hale, we meet a woman who has become an attorney-turned-private investigator and assists the local police department in the unsolvable crimes. Volunteering her time offering legal advice at the women’s’ shelter, she seeks to offer strategies and support to abused women. The story picks up when mothers are being murdered. We also meet a priest who has been unwillingly pulled into the crimes. An unsavory parishioner has decided to tell him every gory detail, including the logic, of every murder. Bound by the Sacramental Seal, he agonizes over how to deal with the information and begins to question the validity of the Catholic confession practices. Wrapped in suspense and sealed with religious mystery, this novel deals with so many issues. It makes for a great book for readers who enjoy Dan Brown. Each character, full and round, had a story to tell. This review has been hidden because it contains spoilers. To view it, click here. A woman with a history of domestic abuse is reported missing and her husband is pulled in for questioning. A relationship of too little too late with the local police prompts her sister to contact a private investigator and the team of Griff Cole and Britt Callahan take the case. When the woman is later found dead, her husband is charged as the likely killer. But with the discovery of a second body exhibiting the same lethal wounds and ties to a nearby women’s shelter, questions arise and what l A woman with a history of domestic abuse is reported missing and her husband is pulled in for questioning. A relationship of too little too late with the local police prompts her sister to contact a private investigator and the team of Griff Cole and Britt Callahan take the case. When the woman is later found dead, her husband is charged as the likely killer. But with the discovery of a second body exhibiting the same lethal wounds and ties to a nearby women’s shelter, questions arise and what looked like a slam-dunk becomes anyone’s guess. The case goes to John Stark, head of the Criminal Investigations Department, a veteran cop and a close friend of Griff Cole. While bodies continue to surface, one person knows where the killer is. Father Francis, a priest at The Church of the Holy Child, listens to the killer’s disturbed account of each murder and wrestles with the vows that bind him to secrecy. When Cole’s ex-wife goes missing, the case takes an unexpected and personal turn and a connection to his past and the women’s shelter points to the killer. Patricia Hale is the author of the stand alone mystery, In the Shadow of Revenge. The first book in her new PI series, The Church of the Holy Child, will be released August 15th. Watch for the giveaway coming soon. Patricia lives in New Hampshire with her husband and two dogs.